100 BEAUTIFUL AND UNIQUE MANDALAS FOR ADULTS. DIFFERENT LEVELS OF DIFFICULTY: MEDIUM- TO HIGHLY- DETAILED MANDALAS. ENSURES LOTS OF JOYFUL COLORING HOURS. 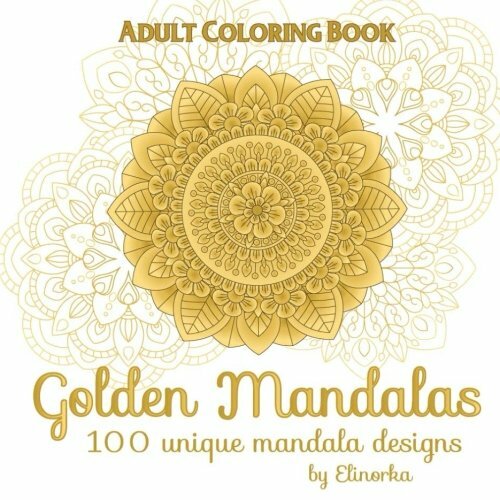 “Golden Mandalas: 100 unique mandala designs”, coloring book for adults, invites you into the mystical world of an ancient art therapy to discover a very unique way of relaxation, focusing, meditation and stress relief. The book contains 100 unique mandalas, which include floral and geometric elements. Each mandala is printed separately with blank back page to allow you to cut out, insert it into the standard 8.5”x 8.5” frame and show off your incredible art masterpiece to family and friends. The time has come to reveal the artist within, to take your colored pencils or markers out and make a first step on the path towards a magnificent world of colors and relaxation.